Can we get one thing straight before we start, please? 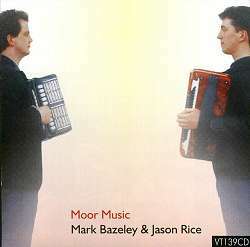 Mark Bazeley and Jason Rice are not copies of Bob Cann or the Rice brothers! They merely sound like them - as I apparently sound like my Dad on the phone, or Sheila Stewart sounds like Belle ... it's inevitable that they should; they come out of the same environment, upbringing, tradition. Anything more than a cursory brush with their music should tell you this; Mark sounds like Dartmoor, like the Pixies - not like someone copying Bob Cann (and what little I've heard of the Rice brothers indicates that the same is true of Jason). I'm prompted to make these statements with some force by various mutterings I encountered on various 'folk' Newsgroups and elsewhere ... and by the, I suppose, inevitable way in which the notes to this otherwise excellent CD tend to focus on the players' grandfathers rather more than they do on Mark and Jason themselves. These are not kids any more, they're grown men with families and lives and music of their own, and it's really time we all started viewing them as such, and judging them by what they are, rather than as what they represent. OK then - this is a record of a melodeon player and an accordion player who are regular, working, dance musicians - and also active members of 'the folk scene' - who maintain a family tradition of regular village dances on Dartmoor and, recently, much further afield, who are the front-line of a small semi-pro band, who integrate their own compositions and material from far-wider sources with the legacy of family tunes passed on to them by tradition. They were asked to make a CD by a small, independent English record label - and this is it. How does it stand up to scrutiny? Extremely well, in my judgement. The playing is excellent throughout and the two reed voices are so tightly together that one might imagine that they'd been playing together all their musical lives. Indeed this is so marked that it's often difficult to decide if it's one box or two playing at any particular point (and the notes don't enlighten us - neither are we told whether Mark plays concertina anywhere on the record). For myself, I'd have preferred to hear some interplay between the two of them, but it's obviously not what they do. Fair enough! The music is great; lots of good tunes, some of which you'll be familiar with from Bob Cann's repertoire, some from general English dance music circles, plus a number which may be new to you. There are also three fine jig tunes of their own composition - KP's Jig, The Rose Garden, The Trip to Gidleigh. The first two of these have been heard around the place for a couple of years now (sound clip - The Rose Garden), but the last is a new one - at least to me. All are very enjoyable. Also worth mentioning are the two backing musicians to be heard here. Gareth Kiddier (of the Bismarcks) seems to be the de rigeur piano player these days, asked to contribute to a number of recent CDs - and it's scarcely surprising since he's so good at it. However, it must be said that - however good he is - record producers really ought to remember that he's playing back-up, not lead, and he should ideally be a little further back in the mix than is often the case. I'm quite sure that I would fall into the same trap, should I ever be in a mixing studio with his playing on the multi-track ... you'd think "oh, that's a lovely line, or change, or run" - and just nudge it up a bit to make sure your listeners didn't miss it. But, in the end, this distracts from the shape of the music ... makes the whole track less, rather than more. It doesn't happen too often here - but it does happen. Rob Murch adds banjo. His is not a name or a face I'm familiar with, as far as I can remember, but the lack has been mine, absolutely! He plays very much in the Ken Lees style that I like so much, but appears less self-effacing than Ken - more prepared to step into the front row whenever appropriate. Thus, what he plays here is not so much back-up as counterpoint, and a superb job he makes of it - try a little of Jumping Cactus (sound clip). This is a lovely record, and manages that oh-so-difficult trick of being proper dance music that's enjoyable to listen to without descending to the banal strategies of a band trying to make 'a record for listening to'. Veteran's latest Newsletter, giving details of all their recent additions to the catalogue, is now available.